This is my second giveaway post highlighting one of the Big G Retro Cereals. I will be giving away one General Mills gift pack (which includes all five cereals and a gift card) each weekday this week. Enter each day's giveaway to improve your chances of winning, although you can only win once. Again this year for a limited time, Target stores are carrying the Retro editions of five favorite General Mills Big G cereals, complete with authentic "retro" package designs and cartoons from the '50s, '60s, and '70s. These special edition boxes are only available until mid-March! All the boxes have authentic Retro designs, as well as games and activities on the boxes. For even more fun, you can go to GrocerySavvy.com to watch authentic retro cartoons, such as Underdog, King Leonardo, and Dennis the Menace. You can also print coupons for General Mills products! Today I'm highlighting the Special Edition Trix box - from 1968. I never really ate Trix as a child, but I certainly remember the commercials. "Silly Rabbit, Trix are for kids!" The Retro packaging of course has the famous Rabbit on the front, and when you're finished your Trix you can turn the box into the "Trix Toss Game." Remember, you can buy all the Retro cereals at Target stores, but you also have a chance to win some for free! Thanks to General Mills, I am giving away a second Big G Retro cereal gift pack, which includes one each of the five special edition cereals, plus a $10 Target gift card! 1) Follow Frugally Blonde by rss feed. 3) Follow Frugally Blonde on Twitter and tweet about this giveaway. (Leave a link to your tweet.) This may only be done once; no daily tweets. This contest runs for only one week and ends on next Monday, March 14, at midnight. The contest is open to residents of the US only, and the winner must provide a valid mailing address (no PO boxes). I will choose the winner randomly and notify him or her by email, and he or she will have 72 hours to respond. Good luck! I received a retro cereal gift pack from General Mills, who is also supplying the giveaway prizes. I received no other compensation for this post, and the opinions are my own. And I can only really remember the commercials. We mainly stuck with Cheerios. My favorite memory of Trix is the commercials too :) *Thanks* for the giveaway! I remember the commercials "Silly rabbit, Trix is for kids!". We only got Trix on special occassions as a treat. Yum. The rabbit and the commercials, we didnt eat too mcuh of Trix. I didn't eat a lot of Trix growing up either, but I do remember the commercials! I remember the commercial also. I never had the cereal when I was growing up. But enjoy it now. I like the silly bunny and colorfulness of Trix. I remembered the Commercial Silly Rabit,Trix are for kids! This one was my sister's favorite -- I don't care for it, so she always got most of it! I remember Trix having all the different shapes - it fascinated me as a kid! I remember picking out all the yellow trix becausre i hated the way they tasted, lol. I was the odd child who didn't like sweetened cereals but my sisters loved Trix - I remember the commercial 'Trix are for kids'. how can you not like Trix? It's just for kids! ;) Lol. I remember the commercials. Haha, yep, about all I remember is the commercials, too. I Remember the commercials-- that's about it! I will always remember the Rix are for kids commercials! Eating it for breakfast before school. I remember eating one flavor (color) at a time! I remember the rabbit on the t commercials. I remember sitting at the table with my brother's and sisters and feeding each other Trix with our eyes closed and trying to guess what flavor we were given. I remember my brother and I eating Trix many mornings for breakfast. 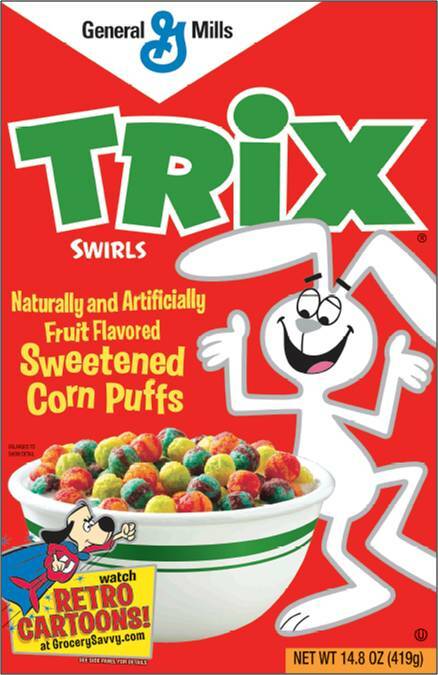 Trix was one of our favorites and we'd eat at our kitchen table and enjoy it. Honestly, my biggest memory of Trix is that my mom wouldn't let us have it. Trix was my favorite cereal growing up. My favorite memory is of the 'Silly Rabbit' commercials! Loved them! I loved the commercials. "Silly rabbit, Trix are for kids!" I loved every year when they would have a vote if the rabbit should get Trix. I just love the commercials! I remember them as a kid. I loved them and still do! I remember one of the prizes that was in a Trix box. It was a purple spoon that changed colors when it went in the cold milk...it was great! I just loved the Trix rabbit---I think I maybe still do. My favorite memory of trix is just seeing the ads on tv as a kid and wondering what the rabbit would be up to next. Follow Frugally Blonde by rss feed. I loved the Trix commercials. I remember the commercials when I was little. Always thought the rabbit was funny! I like the colors of Trix cereal, bright and happy. I love the Trix rabbit! My memory of Trix - we would sort them according to colors :) Thanks! I'm really not sure if I ever had Trix. I like the commercials. Silly wabbit, twix are for kids. I remember the commerical for trix. "Silly mom, trix are for kids"
My only memory is watching the "Silly Rabbit" ads. I've eaten a ton of Trix while watching Saturday morning cartoons. I used to love when my mom would let us eat Trix for dinner! It was a great treat for us! I remember getting to eat this and other cereals like it almost every day as a young kid. I can remember eating Trix and watching Saturday morning cartoons with my family as a kid.My 3 yr old is in love with Trix right now.Thanks! Love the Trix Rabbit and the catchphrase "Trix Are For Kids" from the commercials. One of my favorite cereal's when I was a kid now my kids love Trix! I rememer picking out the flavors of Trix I like the best! MY favorite thing of Trix is the crunch and inviting colours. Trix make great decorations for Christmas lights on a gingerbread house! The silly rabbit and his bag of tricks was always fascinating to me as a child. I always felt bad for the bunny! I wanted him to be able to eat the cereal without someone taking it away. I remember serving myself Trix on Saturday mornings right before sitting in front of the television to watch cartoons! I love all of the colors, so fun to eat and see what color the milk ends up! I loved watching the commercials involving the trix rabbit. My favorite memory is watching their commercials during Saturday morning cartoons!